Infection control should be a prominent part of all esthetic education, but is it? In 2007, I went to what I considered to be a prestigious esthetic school at that time. They taught us how to dress for and perform the perfect service, and even worked on our accents. The room, the products and our personal appearance were to always appear pristine. However, they did not require us to wear gloves. Early in my career, I was extracting a client with many infected lesions. Naturally, there was blood and other fluids. When I got to the chin, I realized my palms had moved directly in my path of extractions and were spotted with blood. If I had a papercut on my hand and that client had a transmittable bloodborne disease, I could have gotten it and vice versa. My room and attire looked great, but I forgot about bloodborne pathogens. The only time we wore gloves in school was during body waxing, and it was only on one hand. For extractions, we wore finger cots on our index fingers with tissues. During sanitation of our rooms, our hands were bare—essentially, we did not wear gloves. After the experience with my teenage client, I wore them all the time, and I thought it was enough. I was wrong. Bloodborne pathogens are disease producing microorganisms that are spread by contact with blood or other bodily fluids from an infected person. Have you ever pricked yourself with a contaminated lancet? I have. When it happened, did you think about the protocol to follow? You must consider the information on the client’s intake form, report the incident, see your doctor for a blood test and tell your spouse about the pending results. It can be a long week waiting for the lab to tell you if you had contracted something through occupational exposure. Were you aware of some of the occupational exposures in our career field? The Occupational Safety and Health Administration (OSHA) states that an occupational exposure is a reasonably anticipated skin, eye, mucous membrane or parenteral contact with blood or other potentially infectious materials that may result from the performance of an employee’s duties. We come in contact with various body fluids through waxing, performing extractions (especially if an extraction is projectile), makeup application, eye lash extension application, etc. Most, if not all, of our services put us at risk if we are not implementing Universal Precautions. These are the consideration of all blood and body fluids—whether they contain blood or not (whether the client discloses it or not)—as potentially infectious, and work alongside Standard Precautions, a set of infection control practices used to prevent transmission of diseases. Below are a few transmissible diseases and various microorganisms to consider. Hepatitis B. There are 1.2 million chronic carriers of hepatitis B in the United States. It has been shown to remain viable at room temperature for a month when not sterilized or disinfected, and spreads percutaneously through ungloved hands, improper handling of lancets, or blood spraying and entering mucous membranes. Vaccinations are available and may be offered to you by your employer free of charge in some states under OSHA regulation. Hepatitis C. There are almost 30,000 new cases per year, with the majority of those infected being baby boomers (some of our most frequent clients). Dried blood on a surface contaminated with hepatitis C can remain infectious at room temperature for six weeks. The greatest risk for transmission is low, but can happen by improper handling of a contaminated lancet. There is currently no vaccine for hepatitis C.
Human immunodeficiency virus (HIV). This disease destroys the immune system and can lead to acquired immunodeficiency virus (AIDS). As of 2012, the Center for Disease Control stated that 1.2 million Americans were infected with HIV. Transmission can occur through percutaneous breaks in the skin or mucous membranes, along with improper handling of contaminated lancets. Suppuration (i.e. pus). It is important to note that infections and disease can be spread by the bacteria found in pus. Always use gloves and tissues following extractions, and spray a topical disinfectant afterwards. If the skin continues to bleed or suppurate, do not follow with facial massage. Be sure to implement a new pair of gloves if you continue with a massage. Before, I never gave much thought to why following certain rules was so important. Weren’t the two gloves enough? I was not coming full circle with standard precautions. Although I had been practicing for 10 years, I cannot say that I was fully trained to operate that way. I had to open my eyes and continue education to see the bigger picture. I know I cannot be the only one. How can we be better? 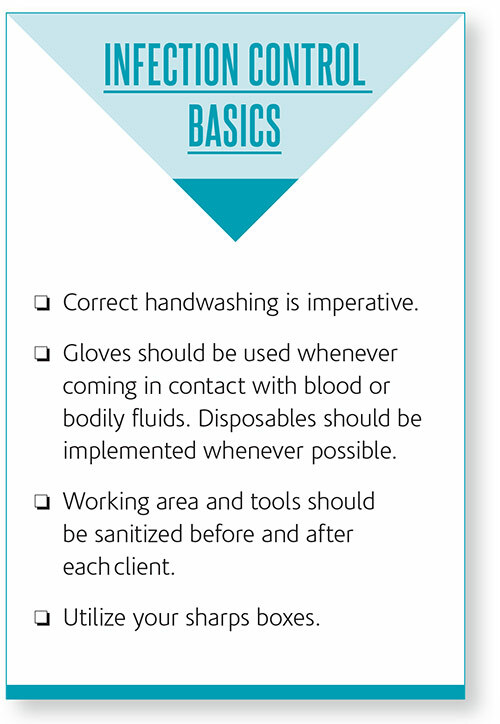 Start with the Infection Control Basics, but continue with the standard precautions, as outlined below. Barrier tape. Use barrier tape as an inexpensive way to reduce the spread of microorganisms. Apply it before your first client and change between each client after sanitizing your room anywhere your contaminated hands may touch; these locations include your loupe light, steamer handle, power switches, cabinet knobs, the adjustment lever on your esthetic bed and chair, etc. Eyewear. Work in the field long enough, and you will run into a few instances when “using your loupe light as a shield” fails. An extracted pustule contains blood and bacteria and, with projection, is well within your range for contacting disease. Protective eyewear is a smart and inexpensive investment. Protective clothing. You want to wear at least a smock regardless of dress code because it acts as a barrier between your street clothes and microorganisms. Liquid resistant options that cover your arms offer the best protection. Wash it at work to avoid bringing germs home with you. Gloves. I hope today we are all wearing gloves (on each hand) for all necessary procedures. Gloves must be removed by pinching the center of one glove to pull off, crumple in hand and remove the other glove without touching the outside surface, and turning inside out to immediately throw in the garbage. Avoid latex options due to allergy contraindications. Surgical masks. Consider these during services you see fit, or when a client is unsure if they have allergies or a cold. If you suspect a client may be experiencing symptoms of an illness that they will not disclose, or are coughing and sneezing, it would be wise to use a mask and gloves for the entire treatment while avoiding: performing a hand massage, utilizing a steam machine and shaking their hand when you do not ask them to reschedule. Intake form. The intake form is such a powerful, and sometimes seldom utilized, tool. I could go on and on about how to create the perfect intake form, but it would be wise to incorporate rescheduling guidelines for infection control purposes. Skin disease such as MRSA. If the client is experiencing one of the above, or conditions such as ringworm, pink eye or certain forms of dermatitis, they must be rescheduled. Have a statement at the bottom of the intake that notes that clients must be rescheduled with the aforementioned conditions. Never put yourself in a situation of spreading disease to yourself or others. In the case of a cold sore, HSV-1 can be spread elsewhere on a client, including their eyes, and can spread to you through percutaneous breaks in the skin causing herpetic whitlow, which is herpes on the hands. If you are experiencing any of these conditions yourself, you must stay home to reduce the risk of transmitting it to others. Proper sterilization. Anything that penetrates skin or encounters blood is considered a critical item and needs to be sterilized. 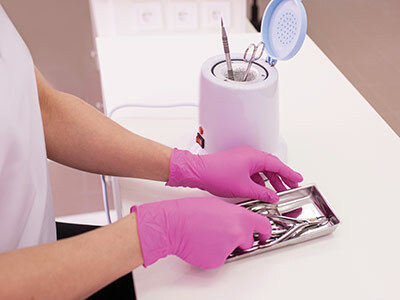 Sterilization is the killing or removal of all microorganisms by use of an autoclave or dry heat sterilizer. Critical items may include microdermabrasion tips, scissors and tweezers. If you are not sterilizing these, you risk cross-contamination of disease. Disinfection reduces the number of pathogenic organisms by use of an Environmental Protection Agency-registered disinfectant and should be used on semi-critical items. Liquid disinfectants and 70% isopropyl alcohol do not substitute an autoclave. I challenge you to challenge others. Are your coworkers, workplaces and local schools implementing standard precautions? Check to see if they, and yourself, are following these guidelines and are currently OSHA compliant. Be sure that your workplace is providing you with the proper safety tools, such as gloves and disinfectants, to protect yourself from illness or injury, and be mindful of your sanitation practices to ensure a safe work environment for yourself and all who come into contact with you. You will feel complete about your career when you are aware of this and spread the awareness to others. Standard precautions such as protective eyewear and clothing help guard against infection. All critical items should be sterilized not disinfected. Erika Lauren is a licensed esthetician and airbrush tan specialist of 10 years. She’s also an active member in the spa industry as a writer and trainer. Contact her at ErikaLaurenEsthetics@gmail.com. This article appeared in the January 2018 issue, see what else was in this issue's digital edition.